On Wednesday 5th December from 6pm – 9pm, Steyning High Street will once again be transformed into a magical winter wonderland, with a candlelit lantern procession, live bands, carol singers, a nativity scene, donkeys, and a plethora of fantastic stalls with crafts, hand-made goodies, and delicious hot food & drink, plus of course, all your favourite high street shops will open their doors and welcome you! In time-honoured tradition, at the bookshop we will be a-bustle with revellers seeking Rob’s mulled wine (made to a top-secret recipe handed down through generations) and Sara’s home-made mince pies. 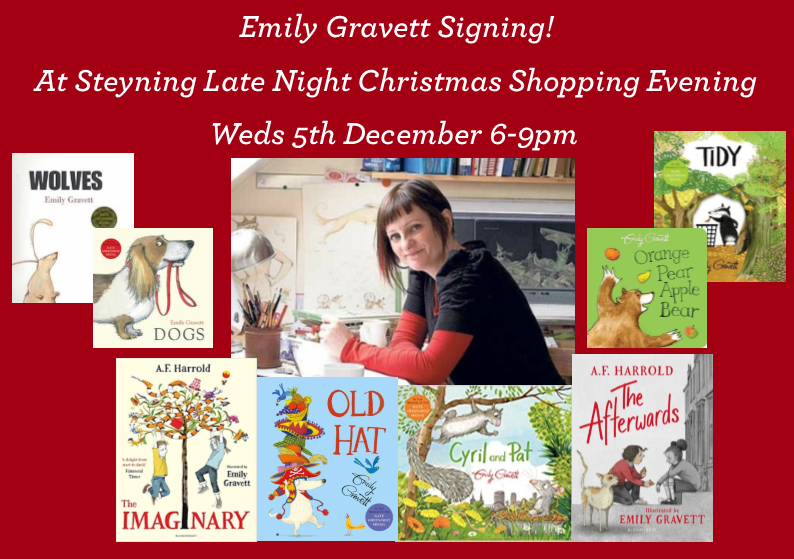 Our author guest of honour this year will be acclaimed children’s author and illustrator, Emily Gravett, who’ll be at the shop from 6 pm until about 8.30 pm to sign and dedicate copies of her books. Emily has won numerous awards for her clever, inventive picture books, and her latest picture book in hardback is the delightful ‘Cyril and Pat’, a heart-warming story about a friendship between a squirrel and a rat! We will have a large selection of Emily’s books ready for signing, from her pre-schooler classics such ‘Apple Pear Orange Bear’ (which no toddler should be without), her quirky picture books perfect for ages 4-7 such as ‘Tidy’, with its amusing environmental message, and the darkly funny ‘Wolves’ and ‘Meerkat Mail’, to her books for older children, ‘The Imaginary’ and ‘The Afterwards’, written by A F Harrold, which Emily has brought to life with her astonishingly beautiful, haunting, pencil illustrations. Do come along and meet Emily, or, if you are not able to come on the night, give us a ring to reserve a signed, dedicated book!